Quiet tension runs throughout this self-titled, all-instrumental album deJune (Alg-a ALG012, released late November, 2005), which is peculiarly attractive or even addictive. The sounds heard here can perhaps be classified as "post-rockish"; the basic sonic ingredients are guitars and various synthesised electronic sounds. The guitars are delayed and heavily reverbed most of the time, while the electronics provide the atmospheric droned background as well as noise and other sound effects, and also function as rhythmic "accents". The reason why I hesitate to put this superb album (and this is the musician's debut solo release) into the pigeonhole of the so-called "post-rock" is its overall absence of strong(-er) rhythmic elements — like that steady forward drive created by the almost obligatory rock/post-rock drum set, be it from highhat cymbals or bass/snare drums. There is relatively little rhythm/beat in this entire release, except for the fourth, fifth and first tracks, titled simply "d", "e" and "a" respectively. And even in these three tracks, rhythmic elements are not too imposing: in "d", brushed cymbals cut a steady rhythm from beginning to end; "e" includes drum playing albeit mixed low in volume at the start and never becomes loud till the end of the track; and in "a", the cymbal work fades in only towards the end. And yet, without that kind of immediately recognisable rhythmic groove — which seems like an inevitable cliché and indispensable fulcrum at the same time in many (and maybe too many) of the "post-rock" —, the music of deJune stands firm. The seven tracks in this release, therefore, seem to me to have achieved an extremely subtle balance between the ambient/soundscape sound production and more conventional, traditional "music" with melody, harmony, rhythm and whatnot. 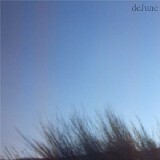 In this respect, deJune reminds me strongly of the series of recent CD-EP releases from the San Francisco, USA band Tarentel, who are apparently delving deeper and deeper into the fusion of soundscape and "music" per se. And borrowing (yet once again) from Brian Eno (linked to the well-known Music for Airports liner notes), deJune here is barely touching the "ignorable" level even though with little distinct rhythm and consisting of higher percentage of ambient-like sounds; and he is still successful in retaining the listner's attention throughout. While successfully blending the soundscape/ambient-like sound production and the more musical elements coming from his electric guitar plays, the tones which deJune uses in this release sound rather simple. His guitars are certainly edited and with added effects, but their basic tone is that of warm, natural distortion. The same applies to the various electronically synthesised sounds. The sweeping winds, heavy, slow wailiing in lower register, background atmospherics — all of these are fairly familiar, "tried and trusted" electronic sounds. Coupling these two together, you might wonder if deJune should end up sounding unimpressive — which is definitely NOT the case, fortunately for both the musician himself and us listners. I tried in vain to figure out how he's done it, but somehow deJune combines all of those deceptively simple tones together to create an enigmatic musical amalgam, without making it sound dull and slack. This, I believe, can be called a feat in itself, and is perhaps justifiably comparable to what Labradford accomplished in their earlier albums with Moog synthesisers and mostly no-frills electric guitars. "Post-rock" or not, deJune was at one time a rock guitarist in a local band, and that was his starting point as a musician. He hails from Galicia, an autonomous community of Celtic origin in the north-west of Spain. The netlabel Alg-a which released this impressive solo debut of deJune is also based in that region, and is run by his friend Isaac Cordal, one of the administrators of Alg-a.com, apparently quite an active artistic website in Galicia. DeJune started playing the guitar when he was sixteen, and the guitar remains to be his main instrument of choice to this day, for nearly a decade and a half. After the first rock band he played in, he had another band career also as a guitarist in the band named Allgodown (unfortunately, as of this writing this Vitaminic website is apparently in the process of reform and is disabling the free streaming/download of the music samples listed in this URL), self-described as "emo" band with some vocals. And since he left Allgodown, deJune is entirely on his own, although he has some plans to collaborate with his ex-bandmate from the second band, another guitarist. For the production of this first solo work, deJune spent approximately two months (only that much! ), all by himself, composing, recording himself, mixing and editing to the finished form. As to the instruments, he used his "guitar, a little electric piano, a BCR2000 MIDI controller hooked up to Cubase SX" on his computer. He is still experimenting a lot with this setup, making various noises first, then refining them gradually with his guitar and other equipments and the software. 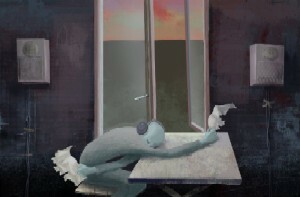 In his process of creating music he aims to express certain atmospheres, mostly with sad themes. I heartily concur with one of his friends who (deJune tells us) told deJune that he was successful in realising his aim. When I told deJune — rather diffidently I must say, as I have a prejudice of sorts that creators generally don't like to be likend to someone before them — that I sensed in his music a similarity to the music of Tarentel and early Labradford, his response was (against my apprehension) very positive; deJune names as his influence, in addition to these two US bands (and Pan American), the bands and musicians on the label Constellation like Godspeed You! Black Emperor/Silver Mt. Zion, and also "Eno, Faust, Cluster, Heldon, Magma, Neu, Can, Isan, Manyfingers, Boards of Canada, Cerberus Shoal... well, everyone who's looking to the other direction". He listens to quite a lot of jazz and contemporary [classical] music as well, and also is an avid cinema fan, particularly of Japanese directors like Ozu, Kurosawa and Kitano. DeJune has already started working on the second solo project, but he tells us that he isn't quite sure yet when that will be completed. Probably we will have to wait for some months at the least for his next release; but in the meantime I for one will most certainly listen to this first release many more times and hardly ever tire of the music. This self-titled debut release can be streamed/downloaded from the Alg-a release page referred to above, which links to the release page in the Internet Archive. Please note that there is also an almost identical release in the Open Source Audio section of the Internet Archive; the only difference is that the Open Source Audio release contains a longer version of the track "a" (6'53", while the one in the Netlabel section is 3'58" long). DeJune tells us that he forgot how this had happened, but he prefers the longer version. According to yet another release page at www.alg-a.com, this work is released under the Creative Commons by-sa (Attribution & Share alike) license. The album "cover" artwork carried here resized with permission, is a trimmed photograph which a friend of deJune's took. As usual, I have created Webjay playlist for this release: deJune. There's also Alg-a sampler playlist, a digest of music picked up from all of the releases to date from this highly attractive netlabel. In closing, my deepest gratitude to deJune, who kindly took the trouble in answering my questions in English, a language foreign to both of us. But as they say, music "speaks" for itself and this release of yours was without doubt the case. Graciñas! 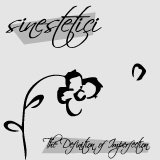 Sinestetici: "The Definition of Imperfection"
An excellent electronica work with truly attractive vocal. Regardless of the genre, it appears (at least to me) that one is able to come across quality vocal music only rather rarely in the current netlabel scene. But this release is, in my humble opinion, one of the definitive cases in point that there really do exist some genuinely talented vocalists emerging from netlabels who are able to sing AND are capable of creating music uniquely of their own. This six song EP of approximately 28 minutes of music, titled The Definition of Imperfection (Drift Records, drift001), is the very first release from the relatively new netlabel, Drift Records, founded some time around May this year (2005). And deservedly is it the initial, literally groundbreaking release for this label, as its song/music writing, vocals, instrumentation and sound production are all topnotch. The main attraction here is of course the female vocalist as well as songwriter/lyricist Sinestetici, aka Sammie (Samantha) Ryan, reportedly an Austin, Texas (USA) native. This attractive vocal of Sammie-san's was the first thing that got me hooked upon my initial listen. But equally attractive to me was the sound production/arrangement of this entire EP. Three DJs/musicians are given credit to as collaborators for this release, viz: KiloWatts, DoF and Daigoro (whose current moniker is Erstlaub). Sinestetici's vocals are intricately treated (effects added, granulated then spliced to turn the bits into rhythm tracks, etc) by these three masters, as typically seen in songs "Reflective Deceptor" (the third track) and "Ideal Chameleon" (the fourth) where KiloWatts exhibits his skills (but not overly done), or towards the end of the last song on the EP "A Love Song", one of the three collaborations with DoF. The instrumentation and arrangement of each song are superb as well. Use of electronic instruments are fair and under a very good controll, just enough to let the melodies and Sinestetici's vocals stand out on their own. I am aware that this is my personal preference, but I simply love the mixture of acoustic sounds from piano and guitar with electronic instruments and effects. Here in this release, the balance is very well thought out and effective. All the lyrics in this release, except for those of "Vision" which is an old Irish hymn dating from somewhere in the 1600's, are my own originals. However, I can not take any real credit whatsoever for the actual production of the songs themselves. I have been very very blessed to have worked with some of the finest talent in the netlabel industry at the moment, and all credit should go to them. [... as for the actual recording/production process,] Believe it or not, everything was done over the net. We all met using a file sharing program called Soulseek. Kilowatts and I did a lot of the discussion and planning of our two tracks together over the phone, but there was no actual face to face communication. I'd send them something I thought would work, they would try it out, if they needed something different they would describe it to me as best they could, and we would work something out as best we could. It offered me the opportunity to take a lot of creative initiative when it came to the vocals themselves, which is something I enjoy immensely. All in all, the process was a lot of fun, and not too terribly painstaking at all. I initially wrote to Sammie-san as I couldn't make out most of the lyrics (after all, English is not my native tongue) and I wanted to know what was sung in these beautiful songs. She promptly gave me a reply, with a lyrics file attached. "I'll be there tomorrow morning"
Anyhow, as hopefully evident from the quote above, Sinestetici's lyrics are in relatively plain words yet loaded with personal feelings and poignant emotions—don't you think? All in all, The Definition of Imperfection is an impressive release, and deserves repeated listening. The sound heard here—a firm and feminine vocal presence that sings touching lyrics in finely-crafted electronic sounds/beats—naturally reminded me at first of my beloved Everything But The Girl (ebtg), particularly in their later career when the duo turned to electronica. This association is maybe valid at this moment, but most probably we should better be on the watchout, as Sinestetici will no doubt be changing with each of her future releases. First, as to legalities as usual. The EP-album The Definition of Imperfection is released under the Creative Commons by-nc-nd (Attribution, Noncommercial & No Derivative Works) license. The image at the top of this article is the cover (top side) artwork of this release, done by Drift Records founder (and a musician himself), Rochie. Carried here with permission. In addition to her (more personal?) website (as linked above), there is another (apparently official) Sinestetici site in the Drift Records domain, from where you can get to her official announcement mailing list. Sinestetici's music is already on 12inch vinyl and CD. For the former, sound clips are available (as of this writing) at Streetwise Music's Kilowatts: Ideal Chameleon page, released from Sober Music. "Ideal Chameleon" is also carried on the CD titled Mixmag Live by Max Graham. Again as usual, I've compiled a Webjay playlist for Sinestetici's work currently on the net: Sinestetici. And yet another playlist for the Drift Records, as Drift Records sampler. Last but not least, Domo-Arigato! to you Sammie-san, for your kindest cooperation in making this little article possible and the wonderful music of yours. Let us imagine summer slowly fading away — sunlight faintly tanning your skin, hot yet dry and crystalline air, utterly silent afternoon approaching sunset, white streets with no one in sight.... This will no doubt be a day in utopia, a place that never exists, because in reality a typical summer day here in Tokyo is too humid and almost aggressively hot which won't even allow you to ponder over something. Most certainly, however, this superb compilation album will let you spend hours simply sitting/lying about doing nothing. And it will bring your mind to some place some day that never was/is/will be, to a precious dream-like summer's end that is both curiously empty and surprisingly fertile at the same time. I have never had a chance to visit Lithuania. Its name reminds me of reports on the media about the "Baltic countries" towards the end of the Soviet era, or of Sugihara "Sempo" Chiune, the "Japanese Schindler" who was stationed as a diplomat in Kaunas, then the nation's tentative capital, during the WWII when both the Nazi Germany and the Soviet Union were struggling to establish hegemony in the region, but nothing more. Now I know that Lithuania is home of the netlabel par excellence Sutemos. I wonder what the summer is like over there. The high calibre of music that is released by Sutemos is clear to anyone if he/she has listened to any track from their catalogue. This cannot be brought about by sheer chance, as the label's ten releases so far definitely have something in common, a "policy" or "intent" of sorts, a consistent taste — which becomes all the more evident when you listen to the Sutemos compilations, where a wide range of musicians/bands with their unique musical styles, instrumentation, etc contributes to giving a very integrated feel to each album. The brains behind this label appear to be always aware of what they aim to put forward as their label's characteristic, and have issued releases slowly but steadily with utmost care and pure love of music. In theory, their musical excellence is not to be surprised at for me, since I have already called this label "the netlabel par excellence"; yet in practice, it must be a demanding endeavour to actually achieve and maintain the standard this high, in terms of amount of time and labour. Anyhow, what initially attracted my attention the most was that this label was from Lithuania, a country which many would hesitate to name as one of the musical centres of the world. Sutemos' fast and far-reaching success inevitably reminds me of another seminal label in the past, of more than two decades ago — Crepuscule. The Crepuscule label claimed to hail from Brussels, Belgium, a rather unexpected location for music label headquarters, where many popular/unheard of musicians and bands of unique music styles and superior merits were (at least virtually) gathered. And the label released quality music, often in the form of compilation that almost always managed to convey a sense of integration, a unified atmosphere to its listeners. I should quickly note here that the musical styles and genres of these two labels, with almost a quarter of a century in between, were not that similar. The resemblance is strictly limited to the fact that each label has a sort of distinct "colour" common to each of their releases, and also that the overall standard of music they released is extremely high. And as it happens, both of them are from countries with relatively low musical profile. Hopefully, this comparison of Sutemos to Crepuscule won't be totally out of place. Out of my ever growing admiration for and interests in Sutemos and their music releases, I gathered my courage to write to them. What follows is a virtual interview conducted through e-mail, with one of the founding members of the label, Walkman. In my initial message, I explained that I am a relatively new listener to netlabel music (and electronica in general) and that I am not a professional music journalist, just a music lover and occasional scribbler with tiny readership for this humble weblog. Despite these shortcomings that clearly won't contribute much to Sutemos' publicity, Walkman was very cooperative in conducting this virtual interview. My most sincere thanks to you, Walkman! [Q] To be perfectly frank with you, my very first impression about your label was "Why from Lithuania, for this high calibre of music?" I believe I am not too wrong in saying that very little is known over here (and perhaps in many other countries) about the contemporary music scene of your country. Can you tell us how Sutemos got started? [Walkman] The website Sutemos.net as a project was born more than two years ago. Original intent of it was to introduce Lithuanian youth to experimental electronic music, IDM culture. I guess that's been achieved a while ago through this website of ours, so we launched its English version, and opened a netlabel to introduce other people around the world to the sounds that we really enjoy. There are two goals that we aim to achieve through Sutemos. First, to develop such a netlabel which would be no worse than a real label. And second, to prove that free music in the internet is of the very high quality. That's what we have tried to do, and needless to say, what we intend to continue doing, too. [Q] Can you give us some "background" information of your label — the main personalities behind the netlabel operation, what are their favourite types of music and bands/musicians, some interesting episodes related to the label? This kind of rather private anecdotes aside, Sutemos as music label simply wants to release the music/artists that we really like. We had only pure love of and interest in electronic music at the label's start. Now, after some two years, we certainly have good relations with various artists, but we try to push the boundaries further. By "pushing the boundaries further", I mean we are doing the stuff no one else thought possible to do. Let me give you an example. Sutemos has released four compilations: Intelligent Toys, Intelligent Toys 2, Flow.ers and the latest Red, Green, Blue & Other Summer Feelings. Most typical of how we have "pushed the boundaries" would be Intelligent Toys 2. The artists who contributed to this compilation are real superstars in this kind of music — so that's a good surprise to start with. And not only did these artists agree to take part in our compilation project, but also they were happy to provide us with tracks specifically created for this album, and they even let us distribute these music freely and exclusively through our label. I guess what was achieved through our compilations is some kind of revolution among netlabels — we did push the boundaries where no one else could before us (at least people tell us such things — I don't know if I believe in them). We always thought it would be just plain uninteresting to do the usual, conventional things that almost every single music label does and release music that doesn't stand out on its own. We have to be different because we really want to be noticed by people. [Q] Is Sutemos into some particular music style, would you say? [Walkman] Talking about musical style, it is based on our personal tastes. By "our tastes", we mean those of the two people who run the label — Sutemos and myself, Walkman. And since the tastes are very different between the two of us, there is no particular style. The only thing we care is absolute quality of the release that we enjoy ourselves. [Q] The quality of a label's output of course depends on the talents and abilities of musicians/bands that the label carries, and in this sense your label's network of extremely talented musicians/bands is surprisingly well-selected and well-formed. How have you achieved this? How do you approach musicians/bands in the first place? Is it a kind of chain reaction — like a musician knows another, introduces him/her to you, then another and so on? [Walkman] This was achieved through hard work. We write beautiful reviews, translate many of them into English, inform the artists reviewed of our review's URL, and wait for their responses. You are most likely to be surprised at the number of positive responses you'll get from artists, if you contact them directly. When you tell some artist that you love his sound, that you have written a review of his album, and ask him politely to read your review, you already have conquered his heart. So that's how we are building our network of artists, and I guess this is the root of our success — start communicating with hundreds of artists via our reviews, which contributes to forming a solid mutual trust between the label and the artists. But of course not all of our reviews were written and translated in pursuit of artists — I believe other people like to read them as well. And yes, in some cases, it is kind of chain reaction as the world is relatively small — everyone knows each other. Sometimes we discover new artists by accident, like in our encounters with 3tronik, Stockfinster and some more. [Q] While many compilations are nothing more than a collection of music with no apparent interrelations or significant connections between each track, I am truly impressed by the quality of your label's compiled albums, their "integrated" or "unified" atmospheres and tastes. Can you reveal us a bit of the secret of how you do this? [Walkman] I guess we have talent for that. It happens naturally when you strive for the best quality available. I always give a lot of attention to the order of tracklisting — I guess this works very good for all the releases. Second thing that we care a lot about is we MUST LIKE THE MUSIC and the music must fit the content of planned release. I have tons of unreleased tracks on my computer just because they did not fit in musical context. This is the price we pay for quality. Sometimes we kind of joke that if the day comes at last when we have nothing to release, we will compile all the music that is left unreleased and make a "Sutemos B-Sides" compilation. Up until here, you may have wondered that I am a bit obsessed with Sutemos' originating from Lithuania. But I have my own reason for this: the Sutemos catalogue contains many tracks from musicians and bands from/in Lithuania, like IJO (about whom I referred to in one of my previous articles (sorry, this is in Japanese), FusedMARc (linked to their official website; there is an interesting introduction in Sutemos.net as well) and Lys, all creating impressive music. This may be one of the signs of active music scene in that country, and that was a surprise to me. Actually, geographically speaking the musicians/bands that get released by Sutemos are scattered around the globe, from North America to Europe, to the label's home Baltic countries to Russia. In this age of electronic network which facilitates literally instantaneous communications and exchange of music in the form of encoded files, perhaps Sutemos should better be called a label "via Lithuania", rather than "from Lithuania". .... Full of summer's evening beauty Red, Green, Blue & Other Summer Feelings will be dedicated to something that can be named as a soft mixture of post/indie rock, instrumental, synth, ambient music with a sprinkle of electronic experiments. Additionally, almost all tracks will be featured by vocals. The works on this compilation started last autumn. From the very beginning we tried to concentrate on esthetics and beauty, not names. No numbers, no facts, no data — just pure and gorgeous beauty. This summery sad and longing compilation will feature artworks from a little fairy No_joy that will be filled with sincerity, tenderness and calmness. I'd urge you to give this compilation a listen, in one sitting from start to finish. Comprised of 14 tracks in total for the duration of approximately seventy-five minutes, the music on this album never betrays the description of the blurb quoted above. What Walkman told us as the label's two goals, "no worse than a real label" and "the free music in the internet is of the very high quality" have been realised beautifully and elegantly in this release. The title of my article, "A Vaguely Sad Summer", is of course overtly influenced from the album's title itself, particularly "... and Other Summer Feelings", as well as from the phrase in the release note "summery sad and longing...". And it is my humble attempt to capture the music on the album itself in words, too; this compilation as a whole is indeed filled with a flow, an atmosphere of summer, with lots of emotions and memories. Plain code progressions (be it in major or minor) in most of the tracks, slowish tempo throughout and comfortable, not too strong beats, effective sound control with lots of "spaces" — all of these contribute to giving a unified, strangely attractive impression of summer. The album title is definitely apt — and this aptness in turn signifies the sure and solid production process/methodology of this label, with clear purport of the entire compilation firmly in the producers' mind. In this respect as well, Sutemos as music label is competent and strong. Hot and dry, yet subtle and somehow sad breeze of summer immediately starts to seep into your mind as the album kicks off with its first track, Marsen Jules' "Couer Saignant" (my personal favourite on this compilation). The layered sound of sampled(?) acoustic instruments (harp and strings?) functions as the perfect introduction, and is a true gem uniquely his own. The vocals that the release note referred to are mostly low whispers or choruses not overly expressive, and use of synthesisers and other electronic devices blends well with sounds from acoustic instruments like guitars and cellos that are featured in many of the tracks. The sixth track "A Crack in Time" by Stockfinster, particularly its featured male voice mumbling about something abstract, reminds me of Labradford's "Everlast" (from their 1993 debut masterpiece Prazision LP), but the music here is somewhat brighter. Towards the end, the album apparently changes air and gathers pace at its tenth track, "The Great Century" by Reed Rothchild (another personal favourite), in what I consider to be a typically "Sutemosian" fashion of flowing and quiescent beats; the three tracks follow, two of which can be described as so-called "post-rock" numbers driven by guitar riffs and steady drumming. And "Funny" by FusedMARc, the longest (some eleven minutes) on the album, closes this 75 minute dream trip, with a stronger beat created by the heavy bass guitar line on top of which ethereal high-pitched female voice dances. The image at the top of this article is "Instability", a painting by no_joy aka Erika Minkevičiūtė, who was also mentioned in the release note. I chose this piece and asked for the permission to carry its image to accompany this article, as I thought it was perfectly fitting to and the most representative of the entire mood of this superb compilation. Many of her impressive works are displayed in the artist's own website and repeated visits to her site is rewarding; her paintings appear to me to share a unique strength hidden deep within the easily discernible delicateness and fragility. When I was almost finished with the draft of this article, it occured to me that I had forgotten to ask one obligatory question: what does the name of the label "Sutemos" mean? "Sutemos" in Lithuanian means "dusk" — the magic time of the day when the sun is already down and sky is coloured with most beautiful colours. This was a genuine coincidence to me, as my comparison of Sutemos to the Belgian record label of more than twenty years ago had been in my mind as I began exploring their catalogue and got hooked immediately to their releases several months back. It was totally beyond my expectation that their label names shared an identical meaning. Walkman also informs us that there will be another release from Sutemos towards the end of this month, September 2005, from one of the musicians who participated in the Red, Green, Blue... compilation. I am 100% certain that I am one of the many around the world who are eagerly anticipating more from this superior music label, one of the best of the bests, be it real or net- label. First, as to legality. Please note that the image of No_joy's painting in this article is a copyrighted material, and carried here resized, with permission. This should have come first, but once again my deepest gratitude to Walkman and the Sutemos label, for their cooperation in writing this little article about them and their music. For easier downloading of the Sutemos releases, visit the label's page in the Internet Archive. You often find the term "whole wheat" printed on the package of organic food products, and it has a certain ideological connotation (or so it seems at least to me), like environmentalism and fitness-conscious. This may well be a rather personal bias of my own, but you might nod and smile when you browse through the photos in the "Photo" section of the station's website. I do not personally remember the early to late 1960s when hippies and their sub-cultures were in fashion and the anti-war protest against American intervention in Vietnam was fierce, but those two persons photographed appear to have a "feel" similar to that from the said era. The music played over their mp3 stream is mostly by independent musicians and bands, often of the singer-songwriter type with single acoustic guitar or jam bands. The gentleman photographed is the master of this webcast radio, Mr Jim Kloss. And the lady, whom Jim-san calls his "better half" (another good old phrase, no? :-) is Ms Esther Golton. She is a singer-songwriter herself and also plays the Appalachian mountain dulcimer (I knew virtually nothing about this unique musical instrument). The voices of both Jim-san and Esther-san can be heard in the station's programmes from time to time. [The stream is] live... sort of. Whole Wheat Radio is a paradox: It's a down-to-earth station, but it relies heavily on technology. So much so, that it can run itself with no human intervention (assuming, of course, that the computers don't crash, and the music streaming provider doesn't go down — hey, stuff happens). The music is programmed in advance, but the playlist can always be over-ridden by listener requests. Most of the time, there is a live human being lurking in the background. This human goes by the name of Jim Kloss. Throughout the day, Jim puts on his DJ hat, and adds his personal touch to the broadcast. I found this webcast just a few days ago. I first visited Jim-san's weblog, followed the link from there to WWR Station Site top page, where I realised it was a streaming station. As you can see if you go on their "Guided Tour", this station site offers each listener a dedicated "Control Console" page. Through this console, you can have access to the playlist, list of fellow listeners logged in (with personal profiles), song request button and the chat viewer where you can have conversations with other listeners, Jim-san and/or Esther-san, as well as the "EJs" (electronic DJs) which are chat-bots. What a gorgeous set of bells and whistles! For the initial half an hour or so on my first visit to the WWR station site, I was having a peek at this "Control Console", trying to figure out what was really happening there. Apparently it had much more to it than anything else I had previously seen in any of the webcast streaming stations' websites; I couldn't resist the urge to participate for myself. When I joined, Jim-san happened to be hosting his on-air rambling time, and he was so kind to answer my stupid questions (like "Is this a genuine live broadcast?" or "Hello, I'm listening in from Tokyo, Japan. Are you really out there in Alaska?") through the microphone and on to the stream, and also via the chat screen. The "EJ" chat-bots were very active too on the chat, at times mumbling and shouting but mostly behaving themselves; they even made announcements about coming tour schedules of and song releases from the musicians being played on the streaming programme. Last but not least, the WWR listeners logged in were very friendly. In Japan, we have an ongoing attempt quite similar (both in their spirit and also in their orientation and efforts towards listener/viewer involvement) to WWR, the well-known Tokyo Daibutu TV. I have enjoyed watching their weekly live broadcast, reading (but not joining, yet) the log on its accompanying chat screen (on a separate browser window). I found the interactive aspect of Tokyo Daibutu TV that changes and directs the flow of programme extremely interesting. WWR is the radio version of this, but on the air full time without interruption, and with a much more integrated listener/broadcaster communications interface. The fact that you can make a song request from the WWR music library any time you like, and have a chat with fellow listeners and the people in the studio live, through the single "Control Console" gives you such a wonderful sense of participation and friendly company. I'd urge you to experience this for yourself; it's so much fun. The talk portion of the stream is in English, and so is the on-line chat. But if you can manage to ask/answer questions like "Where are you from? ", "What's the weather like in your place? ", "What's your favourite music?" and "Why don't you make a request? ", then you can survive and enjoy. You may or may not like the music that gets played on WWR's streaming, but regardless of your musical taste, I can assure you that you will have a very pleasant time logging in the WWR station site. You can listen to the WWR stream itself from the link in the "Listen" section. At present, the bandwidth is said to be secured for thirty simultaneous listeners. Two stream outlets are offered, one for low bandwidth net connection and the other for better connection. On either, as emphasised in the WWR station top page, MP3Pro works wonders as regards the sound quality at your end. There used to be an outstanding mp3 streaming station named BlueMars/CryoSleep. It has been off the air for quite some time. [NB: Update] The streaming station BlueMars/CryoSleep has come back "on the air" again to the delight of listeners literally all over the world. It resumed webcasting in early July, 2004, with an addition of the third channel named "The Voices from Within". The following little essay was written, originally in Japanese, in late December 2003 and published in January 2004, while the station was off the air (it turned out to be temporarily off, but at that time you could hardly hope it would come back), as an homage to the programming and person(s) behind the streams. I had very little exposure to ambient music in my younger years. There are only two albums in that genre that I would listen to a lot: one was the very well known Music for Airports (released 1978) by Brian Eno; the other was The Pearl (1984) by Harold Budd and Brian Eno. Among those two albums, the former is certainly a classic. More than a quarter of a century has passed since its release, and perhaps a couple of years less than that for me since I bought the LP. Yet I have listened to it over and over, literally thousands of times, and it never bores me. To me, as well as, I suspect, to many others, Music for Airports has been almost synonymous with the genre of ambient music itself; it is the definitive ambient album. Harold Budd's The Pearl sounds a little bit more melancholic, with its impressive use of acoustic and/or prepared piano combined with atmospheric drone by synthesizers which often leads you reminiscence of the past real and imaginative. The programme contents of BlueMars/CryoSleep, in my humble opinion, did have achieved the aims and standards of musical quality that Eno explained in the passage quoted above. I preferred to listen to the quieter, more soothing (at least to my personal tastes) selection on the CryoSleep channel, but also on the alternate outlet BlueMars, extremely high quality ambient music was being streamed non-stop, without station breaks, sound stickers or jingles. Exactly as Eno says, the selection on these two streaming channels could and in fact did command your concentration if you wanted to listen to it attentively; or else it could be comfortably "ignorable" while you pondered over something. I would have an almost hallucinating feeling that I had been moved to an unknown place, even another planet maybe, while letting the CryoSleep programme continuously flow through the net connection, especially in the dead of night on to the wee hours of the morning. The old night view from my room window would look quite different then. The official website of this station was also fairly taciturn, but on every visit to check the current playlist, I was always attracted to the "lonely astronaut" logo graphic (see above), which reads: "In Memory of Earth / B L U E M A R S - 2031 and beyond". The website described its two streaming programmes as "Music For The Space Traveller / lone's ambient streams". This "lonely astronaut" image, together with the channel names of blue (and not red) Mars and cold sleep, reminded me of my favourite short story series written by the Japanese scifi novelist Ryu MITSUSE titled Space Chronicles ("Uchu Nendai-ki"), in which cyborg was depicted as an outcast social class increasingly disliked by the "normal" humankind and finally man as a species attempted to desert their flesh and eternally survive as information only — but I digress. Tuning in to the streaming of BlueMars/CryoSleep gave me a very nice occasion to realise the power of ambient music. Some twenty years after first coming across Eno's Music for Airports, it was a pleasant surprise to find that this kind of music was indeed ignorable and interesting at the same time, and also had the capability of transforming the listening space and the listener's recognition of it. Of course, there are currently many streaming stations that broadcast ambient music dedicatedly over the Internet. When you have a peek at SHOUTcast directory for the genre, you can find quite a few. And it was there when I got to learn about BlueMars/CryoSleep in the first place. Now that BlueMars/CryoSleep went off the air, I try and listen to various ambient streaming channels, locating them through search at SHOUTcast by keywords such as ambient, downtempo, chillout, atmospheric, etc (I am not very sure if all of these can be called a sub-genre of ambient music). But unfortunately, in many cases of my trial listening I feel disappointed, thinking and feeling they are not even coming close to the excellent standard of selection in BlueMars/CryoSleep programming. Where is the difference? It appear to me that in many of today's ambient streaming channels, the music played are mostly just pleasing to my ears, but has nothing more to them than that. They are alright as long as you let them flow merely as background music; they never distract your attention, nor do they fail to create a certain pleasant atmosphere in your listening space. These kinds of (merely) pleasing music, however, begin to show their weakness when you want to either ignore or pay closer attention to them. Quite often, they are in a sense too thrusting to be ignored, and simultaneously too coarse or lacking in textures and structure to be attentively listened to. BlueMars/CryoSleep programming rarely, if ever, included these ready-made, self-assuring pieces of "ambient music". Long after its having gone off the air due to the stupid and greedy (for the music industries, and just simply sad and disheartening for us listeners and music lovers) fuss over the intellectual properties rights and webcast "airplay" fee charging, I now realise that BlueMars/CryoSleep was such a special enterprise. I miss it so much. [Added: the 5th of August, 2004] Please refer to the top of this page for an update as to the current state of the station BlueMars/CryoSleep. It is very much alive! Here is the official site of BlueMars/CryoSleep. The unofficial (but not officially unrecognised? ), definitive resource on the web about Brian Eno is enoweb. A profile of Harold Budd @ iceberg.com. [Added: the 5th of August, 2004] When I published the original Japanese article on my previous website (it's still located here) in late January 2004, I had the "lonely astronaut" BlueMars logo image from the station's official website accompany it, without any permission from either lone (the "station master") or (then unknown to me) the site designer and artist splif. In early June this year, when lone kindly let us know via an announcement e-mail that he would resume streaming, I was so glad to hear the good news, and then I realised that as I had expected virtually no comeback of the station, I had not sent the request to ask permission to carry the station logo image in my article, which I should have done long time ago. Belated much too much, but I did write to both of these two gentlemen and they promptly granted me the permission. I thank you, lone and splif, for your courtesy and your excellent work on BlueMars streamings and its official website. The official website has gone under a complete renewal in mid July 2004. And do not forget to visit splif's cool website, Bwoup.com.